The paper analyses some policy issues under a currency board arrangement (CBA), focusing on the conduct of fiscal policy which is the only policy instrument at the disposal of the authorities as the CBA precludes an independent monetary policy. It is argued that the loss in degrees of freedom under a CBA restrains considerably the room for fiscal policy manoeuvre, especially in cases of external disturbances or shocks. 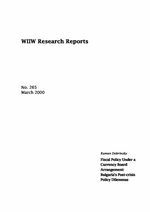 Within this framework the paper analyses some of the policy challenges that policy makers in Bulgaria have been facing since 1997. It is argued that despite the macroeconomic stabilization and the fiscal consolidation achieved after the introduction of the CBA, some serious economic problems still remain and new ones have emerged; among them are the deterioration in competitiveness and the large losses that SOEs continue to generate. The paper addresses also some more general issues related to fiscal accounting during the transition in the context of the intertemporal budget constraint of the public sector. Attention is drawn to the importance of monitoring not only the conventional fiscal balance but also the broader fiscal balance, including the quasi-fiscal deficit.